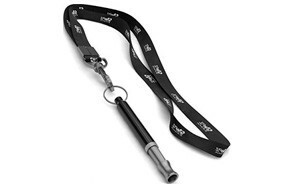 A dog whistle, also known as Galton whistle, is an ordinary looking device that serious dog owners and trainers use to help correct canine behavior, stop them from barking, and even train them to become better, more obedient pooches. These gadgets work by creating sound that only dogs will hear. And if you’re currently on the prowl for a Galton device of your own, you might want to check out our list of the 5 best dog whistles in 2017. Currently classified as the best silent dog whistle, the Ortz prides itself of a variety of uses including deterrence, patrolling, repellent, behavioral correction, and training. It enjoys the trust of many dog owners. However, we cannot help but recognize some of the comments shared by a handful of consumers related to the Ortz’s supposed ultrasonic properties. Some dog owners say that they can still ‘hear’ the sound created by the Ortz. Fortunately, there are a greater number of people who can actually attest to the gun dog whistle’s effectiveness. 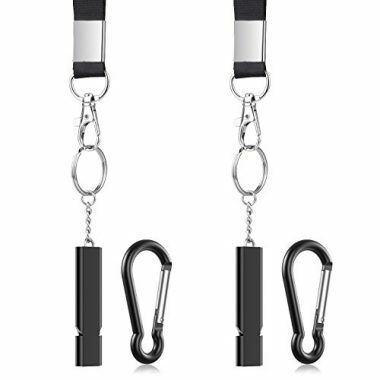 Additionally, its neat design makes it a lot more stylish to wear around one’s neck. The frequencies can be easily adjusted, too. Maybe this is where the problem lies among those who say that they can still ‘hear’ its sound as they may not know how to make the proper adjustments. Overall, the Ortz is a great dog caller. 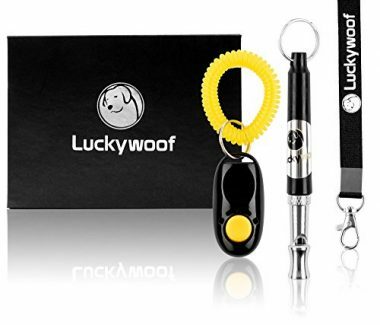 This high frequency dog whistle manufactured by Luckywoof shares many of the ultrasonic characteristics of the Ortz and RUFF. However, it comes off as a more compact and more lightweight device that is no longer than an average person’s thumb length. Sadly, Luckywoof also shares the same comments as those found in the other two products in that the supposedly ‘high pitch frequency’ is still pretty much audible. Whether this is true or not, no one can ever doubt the usefulness of the accompanying training clicker. 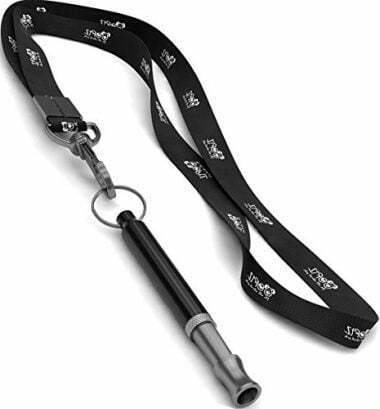 The ACME Dog Whistle 210.5 is one of the most trusted brands of gun dog whistle in the market. It is not really an ultrasonic or silent dog whistle since it only operates on a single frequency of 5900 Hertz. While it is frequently used in canine obedience training, its design is primarily intended for Spaniels especially pooches that have been diagnosed with hearing impairments. Since the ACME operates on a relatively low frequency sound, you can expect to hear the whistle that it produces. The ACME also comes in 8 colors so you have the option to choose one that suits your style. 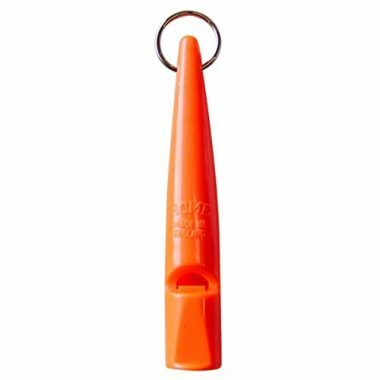 First and foremost, the Michael Josh Outdoor Loudest Emergency Survival Whistle is not the quintessential dog barking whistle that you may have in mind. Technically, it is just like any other ordinary tooter that you blow into to create a loud sound. What makes it quite useful is that the noise it creates can reach up to 150 decibels which is equivalent to the noise created by the engines of a jet airplane at take-off from a distance of about 25 meters. That said, your dog should be able to hear it even from afar. The stainless steel, dual-hole construction gives it elegance, too. It doesn’t contain pea that is usually a magnet for bacteria and mold. The Michael Josh comes with its own lanyard and built-in key ring and carabiner for easy attachment to your outdoor gear. 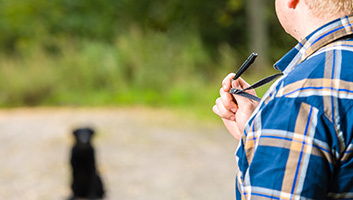 If you’re thinking of buying your very own silent dog whistle to train your pooch, correct its behavior, or even to deter it from doing something you don’t like, then there are several things you have to look for in the right dog whistle. Many of these devices work on the same principle as any other type of wind instrument: you will have to blow through the mouthpiece to produce sound. Unfortunately, you may not produce the same sonic frequency every time. As such, one of the things you need to look for is the consistency of its acoustic output. It is important that the device’s sonic output carries well. What we mean by this is that it should be heard by your pet even from a significant distance. For instance, a device with a 200-foot range is a lot better than one that only has 100-foot range. This means, even if your dog goes up to 200 feet away from you, you can still be certain that it will hear your ‘acoustic commands’. Let’s face it. Some of us actually have butter fingers. Additionally, the ground on which we stand is not really cushiony. As such, it is inadvertent that we can drop these gadgets at some point. That said, you need something made of a really sturdy material. Remember, these gadgets are to be slipped in between your lips, perhaps even touching your tongue. You’d do well to look for a product that can be easily cleaned. This is technically akin to having a device that provides consistent acoustic output. If you can easily adjust the frequency of the sound produced, then that would really make your task of training or even correcting your pet’s behavior a lot easier. 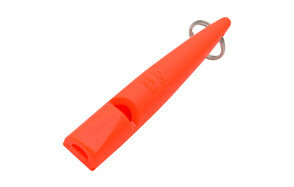 A dog whistle is a device that emits or produces sound that only dogs can hear. The sound created is typically beyond the acoustic frequencies that humans can sense. As such only canines, whose sense of hearing is more acute than humans, can hear the sound created by these devices. Technically they are just like any other whistle that you use to call the attention of someone else. In this case, however, the attention you would like to get is that of a dog. The device was invented by Francis Galton in 1876 as a result of his experiments with various species of animals regarding their hearing acuity and compared these with human auditory capacity. In his study, he found out that humans have a maximum acoustic threshold of about 20 kilohertz. However, this is only for children whose hearing acuity is sharper than adults. As man grows older, his hearing capabilities are reduced significantly that middle-aged adults are known to respond only to maximum acoustic thresholds of 15 to 17 kilohertz. Seniors or members of the elderly population can actually reduce their hearing acuity in half to about 8 to 12 kilohertz, often depending on the existence of chronic health problems. On the other hand, dogs have been known to have a fairly higher maximum acoustic threshold, topping at 45 kilohertz or more than twice the maximum hearing acuity of children, although it is possible that certain breeds of dogs can have hearing acuities reaching as high as 60 kilohertz. Cats, Galton discovered, have acoustic threshold of 64 kilohertz, more than 3 times the maximum of human kids. It is believed that the ancestors of both canine and feline breeds have evolved their hearing acuity to enable them to listen to the faintest sounds created by small prey. As such, when Galton invented the silent whistle, he made sure that the sonic frequency operated well beyond the upper limit of human hearing acuity (20 kHz) but lower than the maximum hearing acuity of the animals (64 kHz) included in his study. This way only these animals will be able to hear the ‘sound’ created by these silent dog whistles. We already mentioned that the quintessential dog whistle based on the original invention of Francis Galton operates on a frequency that is higher than 20 kilohertz but lower than 64 kilohertz. These two values correspond to the maximum hearing acuities of human children and domestic animals, respectively. As such, many of today’s dog whistles are designed to produce sound that range between 23 and 54 kilohertz, although it is not uncommon to see some device that may actually extend the acoustic range to 70 kilohertz to account for other animals. There are quite a number of dog owners who think lowly of a dog whistle, often referring to it as nothing more than a ‘soundless’ device you blow into. While it is definitely ‘soundless’ insofar as we really cannot hear the acoustic frequency operating several thousands of Hertz above our maximum capacity, these gadgets provide a host of benefits especially during training. Here are some of them. Can you imagine sharing the dog park with a pet owner who uses an ordinary whistle? Will it not annoy you? Will the high-pitched sound produced by the whistle not irritate you? The beauty about these sonic gadgets is that only your dog will be able to hear it. You can be blowing on top of your lungs and only your dog will respond to it. You save yourself from eardrum damage as well as a possible lawsuit from your neighbor because of too much noise. Gone are the days when the only way to train pooches is to use aversion methods, in other words, punishment. Today, we use positive reinforcement methods whereby we reward desirable canine behaviors with something very pleasurable, more meaningful. Dog whistles can help us make full use of positive reinforcement since our dog’s full attention will be on us. It will not be easily distracted. And even if it does get distracted, you can easily redirect its focus. Once it does, you can then provide positive reinforcement. Most of us correct undesirable behavior of our dogs by pulling on their leash, squirting a lemon, or even delivering an electrostatic shock on their collars. While these methods may not actually be harmful to our pooches, they are not helpful either. Using sonic gadgets like those invented by Galton can help correct a behavior by getting the attention of your pooch in a non-threatening manner. In fact, it will be simply made curious by the sound that only your canine friend can hear. Your pet actually responds best to your voice whenever you give a command. However, what if you have a raspy voice because of a cold or cough? What if another person were to give your pet a command and one whose voice your pet simply don’t recognize? Since there is a ‘change’ in the quality of the voice that your canine friend is receiving, there’s a chance that it might not actually obey the command. You can help prevent this by using a Galton device, ensuring consistency in your commands as embedded in the kind of whistle that you produce. The good thing about Galton’s devices is that you can actually modify the way in which you create sound. You can go on a single blast or even produce a string of pips. Whatever the case, you are providing yourself with versatility in managing the training and behavior of your pet pooch. Training pooches is one of the areas where silent Galton devices are frequently used. And if you are in the process of initiating training for your pooch using one of these gadgets, you may find these training tips to be especially useful. 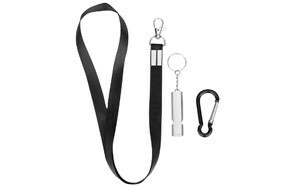 Train your pooch to associate the sound of the whistle to something really great. Anything that has something to do with canine training always starts with creating an association of the device to something pleasurable or meaningful for the pooch. This means that you will need to introduce the sound of the whistle to your pet at a time when it is very happy or feeling really great. This is to make your hound think and associate that the sound of the whistle is what brings great happiness. Always start early and in the home. As we have mentioned above, it is important to start acclimatizing your pooch to the sound of the whistle and to time it well. Again, we have to emphasize the importance of associating the sound to something that is really pleasurable. However, caution should be observed not to overuse it. Dogs are intelligent animals, you know this by now. If you use the whistle every now and then, it might learn that the sound is nothing more than a product of your blowing into a device. Try it in your garden. Before you try it in public, you might need to run a few sessions in the comfort of your own backyard. Blow into the device when your pet’s attention is not on you. If your initial efforts are correct, then your dog’s response will be to stop what it’s doing and turn its attention to you. Call it to come to you and make sure to reward your pet once it does. This way it learns that the sound will eventually lead to a reward. Try it out in a confined, public area. Once you’re confident about your pooch’s abilities, you can try out its skills in the open. However, it is best to do it in a confined area first, such as a dog park or some other area with an enclosure. Use sparingly especially in the early phases of training. Resist the temptation of blowing the whistle very often especially if you’re still in the early stages of your pet’s training. The point is for you to condition your pet’s behavior first especially in accepting the sound as something that is pleasurable. Dog whistles play an important role in training our pets, correcting their behavior, and even stopping them from doing undesirable behavior. Choosing the right dog whistle includes looking at their acoustic consistency, range, durable construction, ease of cleaning, and adjustability. Learning how to properly use these gadgets especially in training your dog is equally important. Remember, these are just tools that can never truly replace hands-on, personalized training of our pets.